On a recent trip to Seattle my husband and I had the pleasure of accompanying our granddog Riggins to Magnuson Park, which is located in Sand Point on Lake Washington. 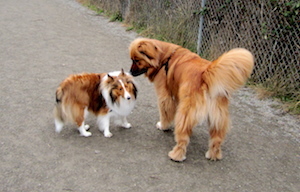 With nine acres of fenced-in land, Magnuson is the largest off leash dog park in Seattle. From the moment you drive in (no admission fee, plenty of free parking, and wheelchair accessible) you’ll begin to feel the uniqueness of the park. As you enter through the chain-link fence you step into dog heaven, beginning with a large open field where you will likely see dogs scampering about like young children who have been excused for recess. As you make your way around the open grounds, you’ll come across a narrower path that leads to the lake. Here is where you begin to mingle with locals (to-go cups in hand and wearing rain slickers more times than not) strolling along. You’ll feel as if you’ve just been dropped in the middle of an ongoing parade. The diverse arrays of dogs are too many to keep straight. All types seem to be represented. Lanky, bulky, stubby, shaggy, buzzed-cut, long-nosed, pug-nosed, slender-tailed, no tail, fur that mops the ground, mid-size, pocket-size, comical-looking, regal-looking, and those that stroll nonchalantly to those that dart from bush to bush searching for the best scent. All but a few of the dogs are off leash and seem to be on their best behavior. When you arrive at Lake Washington beware of flying spray from water-drenched dogs shaking dry. Here is a good chance to rest and enjoy the serenity the waterfront holds before rejoining the parade back to your car. Depending on the weather you may be able to spot a few longboarders paddling by or locate Mercer Island in the horizon. You may also encounter a professional dog-walker or two, just another sign that you are off the beaten path. You’ll know them by the many dog leashes dangling off their shoulders. You’ll leave the park a little dustier, but you’ll leave having experienced a part of Seattle’s unique inside culture. Regardless of whether you have a dog with you or not, Magnuson Park offers enjoyable entertainment while you take a break from the mainstream tourist sights of Seattle. Park hours are from 4 a.m. until 11:30 p.m. Visiting on weekends and after work hours will provide you with the most dog traffic.